Born on September 26, 1874 in Afton, Iowa, Alfred Burton Welch spent the majority of his childhood years in South Dakota where he had daily contact with Native Americans. He would later have an extensive military career. Typically referred to as A. B. Welch, he was well known for his extensive artifact collection and lifelong close association with Sioux tribal nations. Welch resurfaces in history next when he joins the Washington State National Guard/Volunteer Infantry on May 6, 1898 were he serves in Company D, 1st Infantry including a tour of duty in the Philippine Insurrection. He was released from service on November 1, 1899. He listed "merchant" as his occupation prior to enlistment. Welch moved to Mandan in about 1905. In 1906, he was instrumental in organization Company F-North Dakota National Guard to replace the local militia. Chief Grass had learned that Welch fought with distinction in the Philippine-American War. The two men became close friends. Grass lost a son in 1910, and three years later, he decided to adopt Welch in memory of his late son. It was a great honor; the chief said it was the first time in history that any white man had been adopted into the Sioux nation using the full tribal ceremony. The ceremony took place near Fort Yates. He was twice �taken prisoner� by ceremonial war parties and then released when Charging Bear would say, �This man is my friend.� The warriors voted on whether Welch was worthy of this honor. One negative vote would have stopped the adoption, but Welch was accepted and was given his adoptive father�s name, Mato Watakpe or "Charging Bear." With over 500 in attendance, the ceremony also included speeches, converging of elders, drumming, dancing, and singing. North Dakota historian LaDonna Brave Bull Allard writes, �Adoption is one of our sacred seven rites of the Lakota/Dakotas Nation. We adopt all kinds of people young and old. If you lost a sister, you adopted another who reminds of that sister or brother, grandmother etc... We believe that you should never be alone in this world... It is our way,� she concluded. Charging Bear presented to Welch a specially made pipe, and Welch gave Charging Bear a gold watch. Welch also gave the tribe a barbecue, including two steers, 100 pounds of coffee, a wagonload of hard tack, and 100 pounds of tobacco. Commissioned Captain and assigned to Company A, 1st Infantry, North Dakota National Guard, at Bismarck, on June 9, 1913; called into federal service on June 19, 1916, for Mexican border duty and served there until discharged from federal service at Fort Snelling, Minnesota on February 14, 1917, and resumed National Guard status. He was assigned for a short period of time assist with guarding the Northern Pacific Railway�s Missouri Bridge under the command of Major Dan Wright. Joe Young Hawk, an Arikara was once captured by five Germans but subsequently escaped, killing 3 of the enemy. Young Hawk was shot through both legs, but was still able to capture his other two captors and take them back to US lines. Major Welch said this of Young Hawk: �I am terribly proud of him. He ought to have a medal, for really it took all kinds of nerve.� Young Hawk was eventually awarded his medal. His division was also involved in the Meuse-Argonne offensive. He was discharged at Camp Dodge, Iowa, on October. 7, 1919, as a captain. Before his military career was complete, he had served in the Spanish American War, the Philippine Insurrection, the Mexican-American War and World War I. Major Welch served as the Commander of the American Legion Post in Mandan in 1921-1922. Among his many achievements, he was appointed by US President Harding's administration to serve as Mandan's Postmaster from 1923 through 1934. 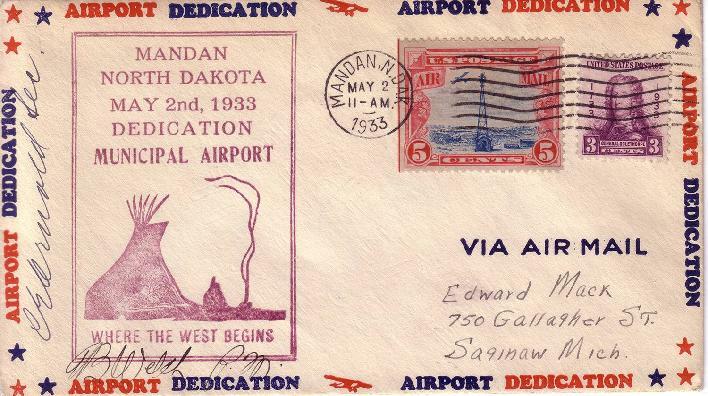 His signature is found on cachets celebrating the opening of the Mandan Airport on May 2, 1933. He resigned a year early in April 1934 and was replaced by Frank S. Hudson. He died in a Bismarck hospital after a long illness on June 30, 1945 and is buried in Union Cemetery. The funeral, held in the Masonic Temple in Mandan, was attended by representatives of the American Legion, the color guard from the Veterans of Foreign Wars and an honor squad from the North Dakota National Guard. The American Flag from his casket was presented to his brother Eldred Welch for his brother's military service, on behalf of a grateful nation. In November 2005, one of A. B. Welch's collected artifacts fetched $118,000 at public auction. 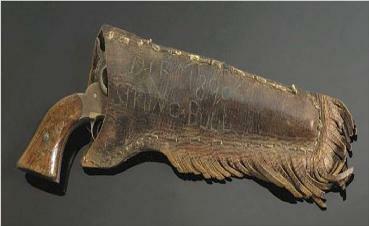 A well-documented Whitney revolver once owned by Sitting Bull had been presented to A.B. Welch in 1920 by a chief of the Hunkpapa Lakota and a cousin of Sitting Bull, No Two Horns. 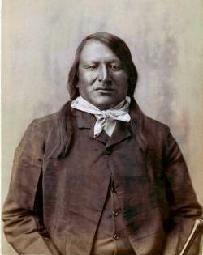 No Two Horns fought with Sitting Bull at the Little Big Horn. The revolver's handle and its fringed leather scabbard are both inscribed with the scratched notation "Sitting Bull Die 1890." This biography was based in part on the July 12, 2004 Dakota Datebook item compiled by the State Historical Society of North Dakota for Prairie Public Radio. The project was supported in part by a grant by the North Dakota Council on the Humanities. The Society appreciates the contributions of these organizations to this Legacy Program biography.